Hairballs are a fact of life for some cats and their owners. But are hairballs really normal for healthy cats? Or could frequent hairballs signal a more serious concern? You probably know a hairball when you see one — an unpleasant-looking, slimy, cigar-shaped wad of matted fur that’s easily mistaken for something you might scoop from your cat’s litter box. 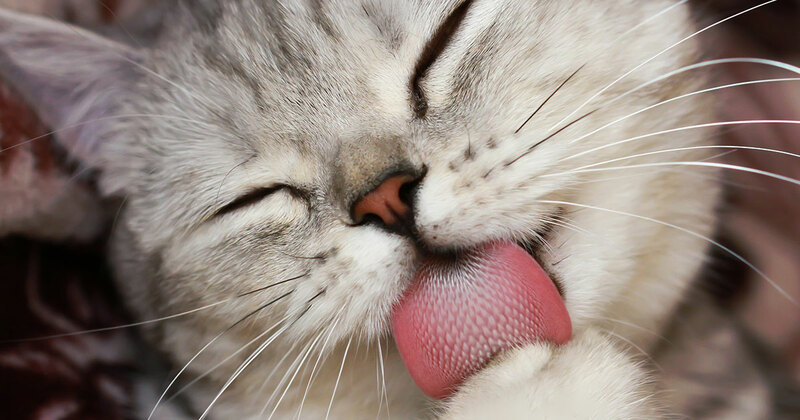 Saliva, stomach juices (aka gastric secretions like mucus) and digested food are also common components of hairballs. Hairballs are a natural byproduct of grooming. Cats are fanatical groomers, and the little backward-facing barbs (aka papillae) on their tongue act like a hairbrush, grabbing loose hair and pulling it into the mouth. The cat’s digestive system has evolved to handle some amount of hair swallowed during routine grooming. Under normal circumstances, swallowed hair moves through the digestive tract along with food and exits the body in stool. But when cats have a lot of hair or are shedding, some hair accumulates in the stomach, where it forms a hairball that irritates the stomach lining. Once the hairball reaches a certain size, your cat typically throws it up. Very little information has been published about the incidence and causes of hairballs in cats. However, veterinarians and cat owners know from experience that long-haired cats are more likely to have hairballs than short-haired cats. COULD IT BE MORE THAN JUST A HAIRBALL? Some veterinarians are not concerned about those cats that throw up a hairball once every few weeks. Other veterinarians consider only one to two hairballs per year to be normal and harmless. But if your cat is bringing up a hairball once a week or more, veterinary specialists in feline medicine like Dr. Scherk now recommend having your cat examined by a veterinarian because they believe that frequent hairballs are a sign that something isn’t right. Additionally, not everything containing hair that a cat vomits is a considered a hairball. Contrary to what some cat owners believe, puddles of clear, frothy or yellow liquid with strands of cat hair aren’t hairballs. They are “vomit with hair,” writes Margie Scherk, DVM, DABVP (Feline Practice), a board-certified feline medicine specialist in Vancouver, Canada. Anytime a cat is repeatedly vomiting (with or without hair), a veterinarian should be consulted. When frequent hairballs are observed, feline medicine specialists consider them to be a result of excessive grooming — which can be triggered by stress or anxiety, skin allergies, pain or external parasites — or an underlying disease that results in abnormal movements of the digestive tract (poor intestinal motility). Inflammatory bowel disease (IBD) and intestinal lymphoma are diseases that can affect intestinal motility, increase the risk of hairballs and cause vomiting. Gary Norsworthy, DVM, DABVP (Feline Practice), a board-certified feline specialist at Alamo Feline Health Center in San Antonio, Texas, has learned that cats who experience chronic vomiting — with or without hairballs — may have chronic small bowel (small intestinal) disease. Small bowel disease starts with mild inflammation in the intestines that, if left untreated, advances to severe inflammation, also known as IBD. And in some cats, IBD progresses to lymphoma. He recommends that cats who are vomiting two or more times per month for several consecutive months should have an ultrasound of their abdomen. If any abnormalities are noted during the ultrasound procedure, then biopsies of the small intestine are warranted. So before starting a hairball remedy, have your cat examined by your veterinarian to confirm that the hairball vomiting is just about the hairball and not a more serious condition. Mild intestinal inflammation and IBD are treatable conditions, and there are no good reasons why your cat (and you) needs to put up with chronic vomiting. There are steps you can take to reduce your feline friend’s hairball issue. Just be aware that no single remedy helps all cats. Regularly brush your cat. Routine combing or brushing, especially of long-haired cats, can help reduce the amount of hair that your cat consumes during grooming. Many cats enjoy being brushed, and it’s a great way to bond with your kitty. But for those cats who dislike being brushed, consider wearing grooming gloves as you gently pet your cat. Give your cat a specially formulated hairball remedy gel or treats. A wide variety of options are available to help eliminate and possibly prevent hairballs. While some products use petrolatum as an intestinal lubricant, others use a combination of omega fatty acids and fiber. Feed a “hairball diet.” For stubborn cases, you may need to feed a cat food formulated specifically to control hairballs like Diamond Naturals Indoor Cat Hairball Control Dinner for Adult Cats or Diamond Naturals Indoor Cat Chicken & Rice Formula. These foods are high in insoluble fiber to help move swallowed hair through the digestive tract. You and your cat don’t have to live with frequent hairballs. They aren’t normal. If you have any questions about your cat’s hairballs or vomiting frequency, please talk with your veterinarian.